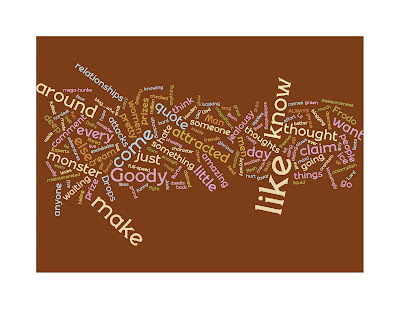 I have to blog about Wordle because it is just that cool! You can create these word collages - I created this one by submitting my blog. The larger words are the ones I write most. Ever wonder what words you blog most? I am officially a valley girl for using the word, "like," so much. I hang my head in shame. I love that! So I just did it myself and want to post mine. How were you able to post it on your blog? You can choose to "print" your java screen, then instead of printing to paper, you can print to PDF IF you have Acrobat. You can then open the PDF and "Save as" a jpeg. If not, you choose to "save it to a public forum" and when you upload to blogspot, it gives you the option to upload a URL. Wordle gives you a URL you can upload once you have saved your collage to a public forum. I think I like the fact that Goody is so big. I am saddened that bum isn't larger.